A few years ago a couple of older clients told me they wanted an Art Deco kitchen, as they were fans of the style. I said "OK". They said "you don't know what we mean, do you"? I thought 'let's give them enough rope'; and asked them to explain to me what they thought an Art Deco kitchen should look like. It became obvious they didn't really know what an Art Deco kitchen was themselves. It was at this point I asked them "were they looking for the Streamlined look, the 'Skyscraper' style, the pastel colours look of 'Miami' Deco, maybe French Deco, Cubist style, Med / Spanish Revival Deco, Egyptian/Mayan Deco, etc. etc. etc. If you asked most kitchen studios or designers for an Art Deco kitchen today, they would probably pop down to the local library or book shop, pick up a couple of reference books & then present you with probably a nice kitchen plan, but with only minor Deco touches. They haven't got time to spend more time researching for a 1 off kitchen, and probably only have a passing interest / knowledge of Deco design. Most of the interiors magazines are little better. They do their Deco themed roomsets every so often. You can bet money that they'll have a black & white chequered floor, and probably the whole room will be B/W themed, with a few small touches to make it a 'Deco' room. But what a difference you would see dealing with a designer like myself, with over 20 years design & hands on experience, and who has studied the Deco style for most of that time! Chalk & cheese. Authentic Deco styling that works is what you get. So, where do you start when designing a new Art Deco kitchen ? The style is an instantly recognisable one. Any clients looking for this style of kitchen, or interior, are fans & knowledgeable of the style, and have some favourite photos as a source of inspiration. Or a favorite designer maybe. This is where you start. You will live with this room for years, so it has to be personal & right for you. Many people think of the Deco style as a single homogenous one. In reality it is an umbrella term covering a wide range of styles. Although generally seen as a between the wars style, it had started earlier & it's influence is still felt today. While the Moderne style may have been the dominant & most recognisable of it's day, many more homes not in this style were built than were built in the Moderne style. Which means many fewer deco style kitchens & interiors were made than other general styles. 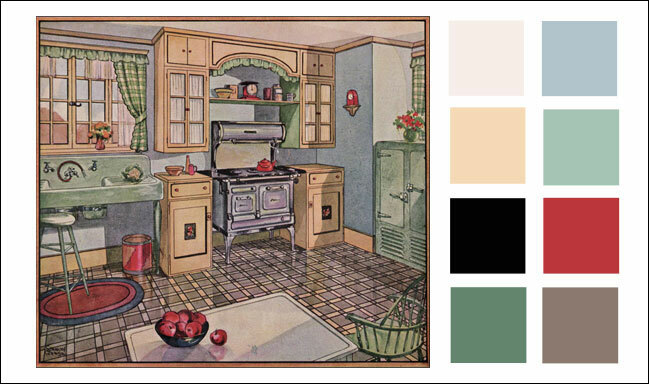 And even in Moderne houses many of them would have had non-Deco style kitchens. And most of the original Deco kitchens have long since been ripped out to fit 'modern' kitchens. Also, pitifully few photographs survive of original Deco kitchens in situ. The styles making up Art Deco also changed over time, as did it's designers. .For eg, Paul Frankl made famous the 'Skyscraper style' of furniture in the late 20's. But by the early 30's he had dropped it, due to the great crash/depression, and went on to produce different Modern work. So you have to choose which style you want carefully. Yet somehow, most Art Deco work tends to be recognised as such immediately. Whatever the stylistic variations, the general look & proportions, the materials, the shapes, the detailing, etc., tend to be common across Art Deco. 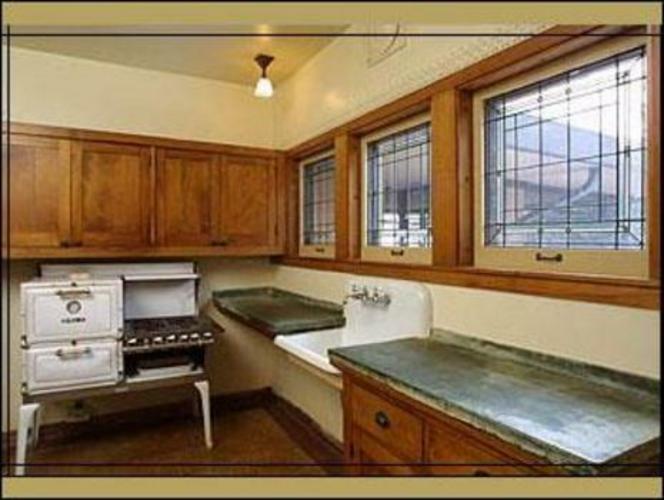 Do you really want an authentic Art Deco kitchen? 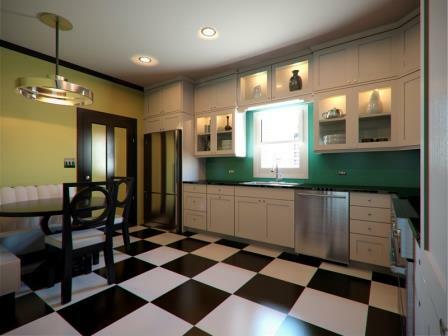 Or a modern version of an Art Deco kitchen ? There's a good reason for asking this. An authentic Art deco kitchen is probably very different from how we might imagine it. Remember the times; indoor plumbing was just starting to be available in homes, few fitted kitchens as we have now, cooking appliances of the times look positively primitive, this was the midst of the great depression & money was tight for most, larger houses may still have had servants so no need for a fancy kitchen, etc. etc. The kitchen was not a 'public' room as now, so less attention was devoted to it. Also, some of the period colour schemes can look bizarre, drab or dark by todays' need for bright open interiors. The bottom line is a kitchen from this period generally looked not much like we would think a Deco kitchen might look. So as a designer, & as a customer, we have to widen our references to design a new Deco kitchen. 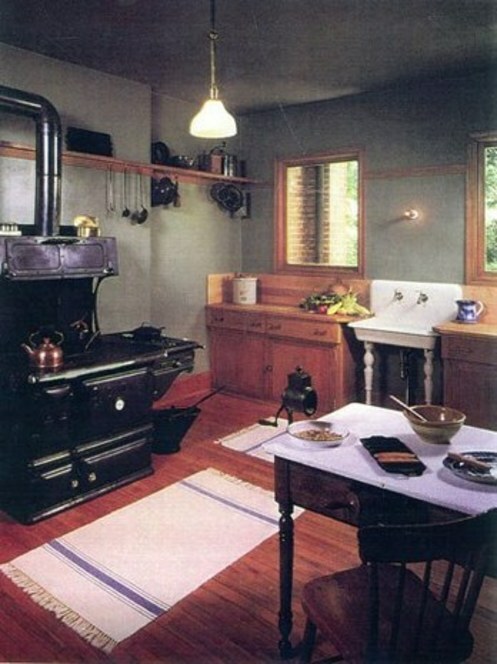 We have to look at original kitchens from photographs & adverts of the time, look at other Deco furniture style & materials, architecture, etc, to pull together ideas for a new kitchen. Basically, you have to design a kitchen today as a designer from the Deco period would have done had they had the range of products & materials available that we do today. So with some good research & inspired design we should be able to produce whatever style of Art Deco kitchen you are looking for. what you want the kitchen to look like, materials, appliances, other works, etc. etc..
We will discuss these points in more detail in the kitchen section. As designers we will cover the southern half of England inc. London. We can effectively design, supply & project manage in this area. Further afield we can handle the design & supply side, but less likely to handle the installation (unless it's a very special job). For customers in other countries we will work with you any way you like; whether just the design, specifications, schedules, work with your builders or more. Speak to us about your project.